Just finished this set. 6 battery coils, one mag coil, plus the condensor coil. They are for a Canadian good fellow's car. Always nice to see examples of fine craftsmanship like this. I can only imagine the satisfaction you must get from your work. It is a real treat to see these things. Those are absolutely beautiful. They look nicer than my living room furniture! When I first looked in here, I was expecting to see a big red roadster! But, no complaints here. In fact, this is my second look in just because I wanted to see them again! My goodness, you do beautiful work!!!!! R.V. 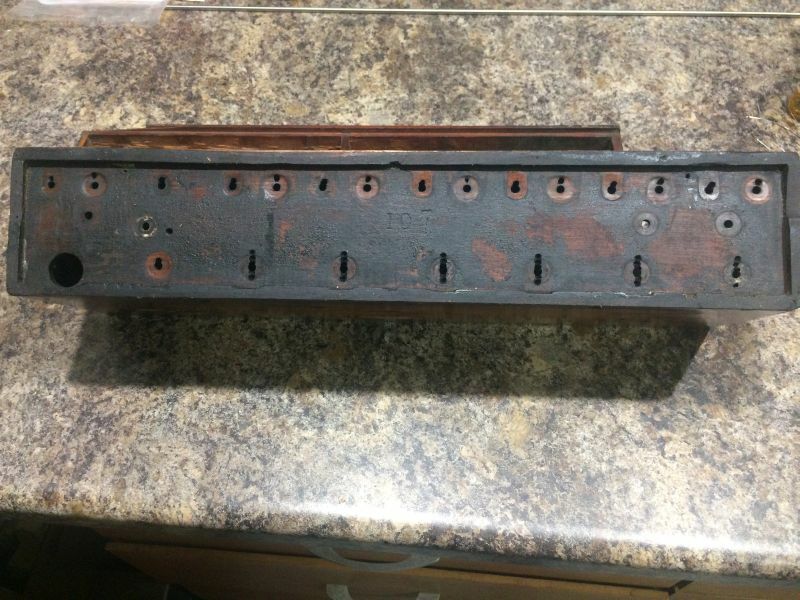 does the bottom of the mag coil look like this? You must have made all new fittings and hardware. Looks wonderful. 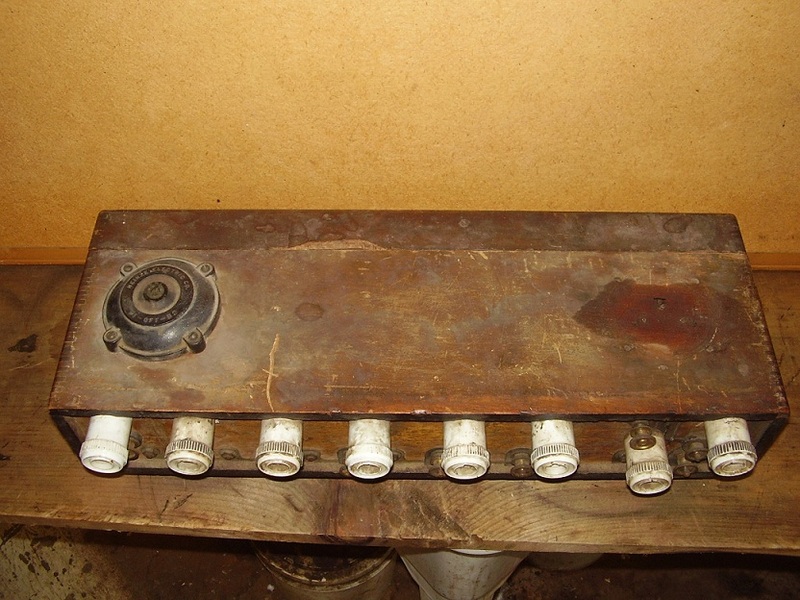 Re;"6 battery coils, one mag coil, plus the condenser coil"
Could you give a brief description of what those entail? Are they all used at one time in the same coil box? Dean, no; it has the same style contacts as the battery coils. That is what the coilbox requires. 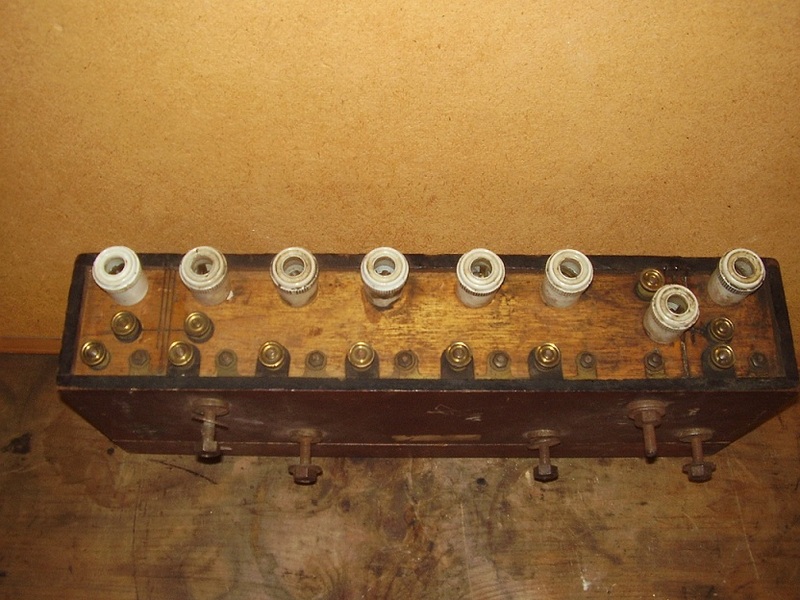 Mark: The Model K has a dual ignition system; the battery side has 6 coil units that run exclusively off the battery. 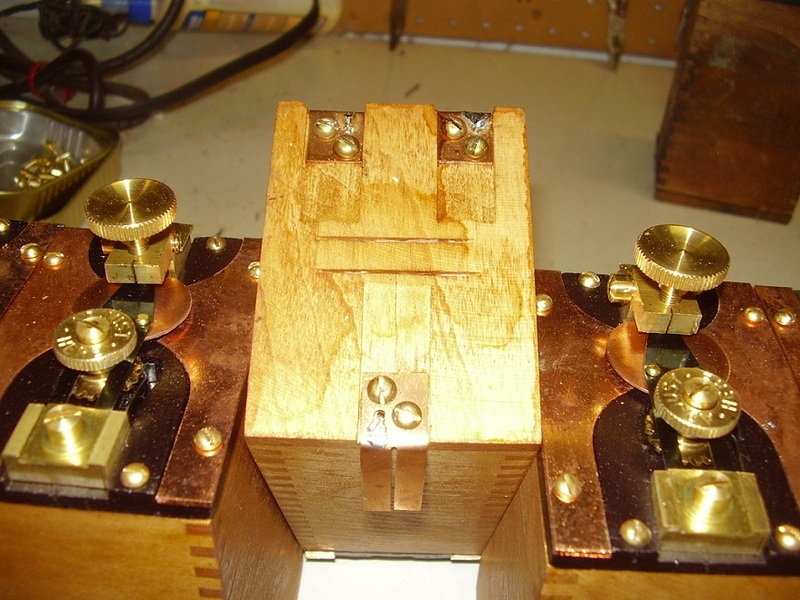 A separate coil unit is powered by the magneto, which requires an external condenser, actually a series of condensers, located inside a separate wooden unit inside the coilbox. It's the same physical size as the other 7 units in the box. 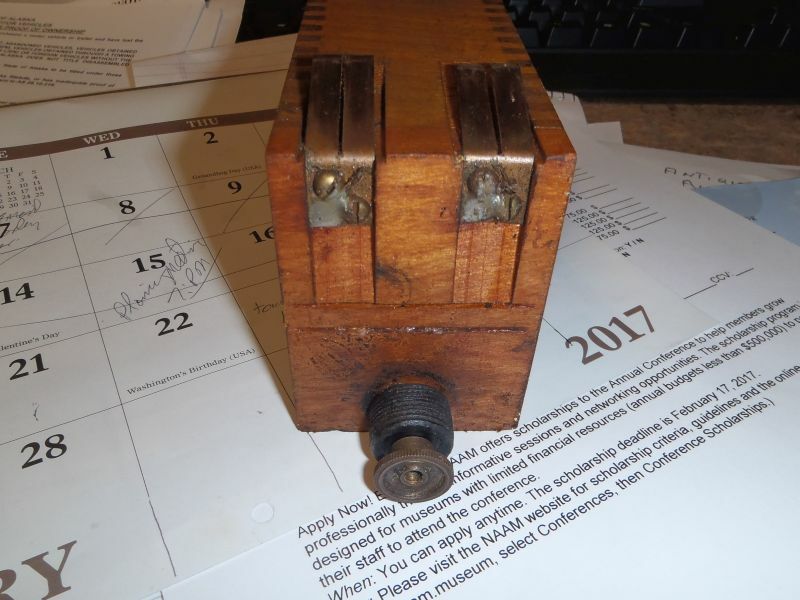 Here are some photos of an original Heinze box used on the Model K. The switch for the magneto side is missing; it's the same switch, physically, as the battery switch that you see on the other side of the box. 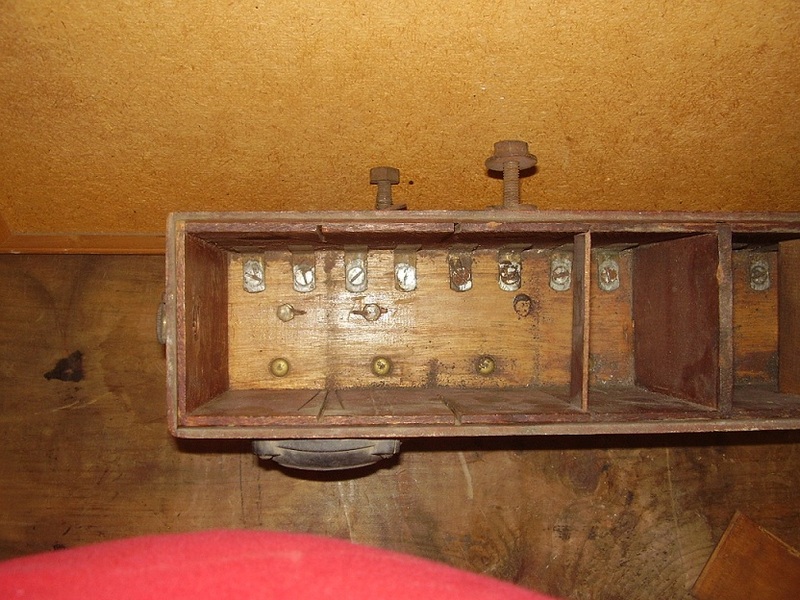 Left hand (battery) side coil unit slots. 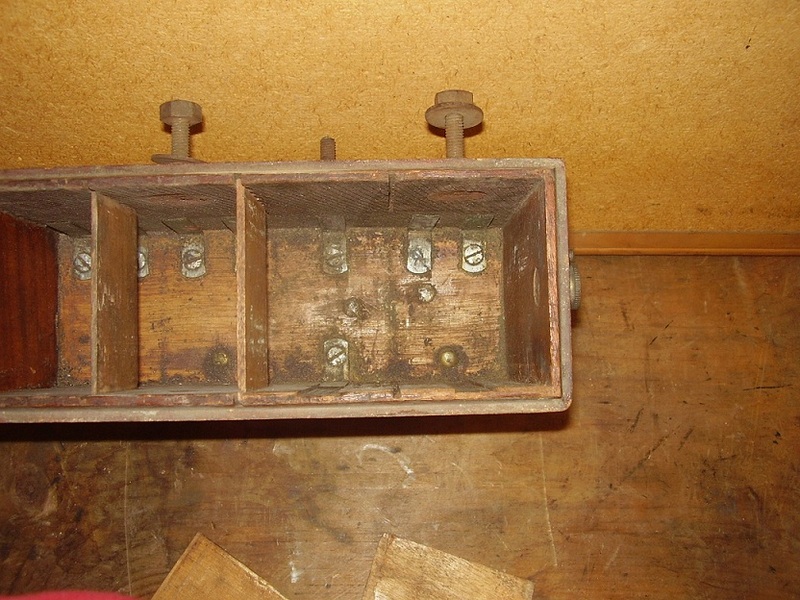 Some of the little wood dividers have been removed in both inside photos. Thanks, guys. 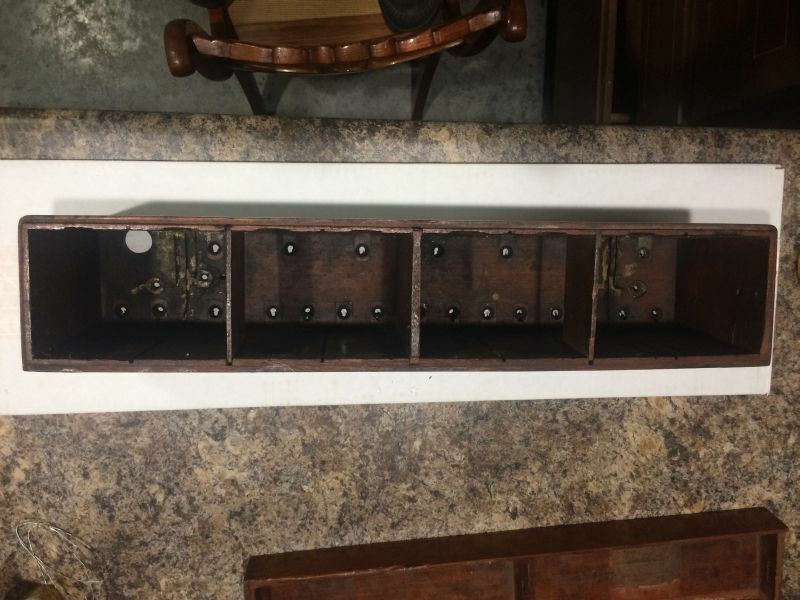 John, you are correct; everything you see is brand new, from the wooden cases to the tops, which are die cast plastic, resembling closely the original hard rubber. Camera flash makes them look shiny. Everything is exactly the dimensions and appearance of the original pieces. 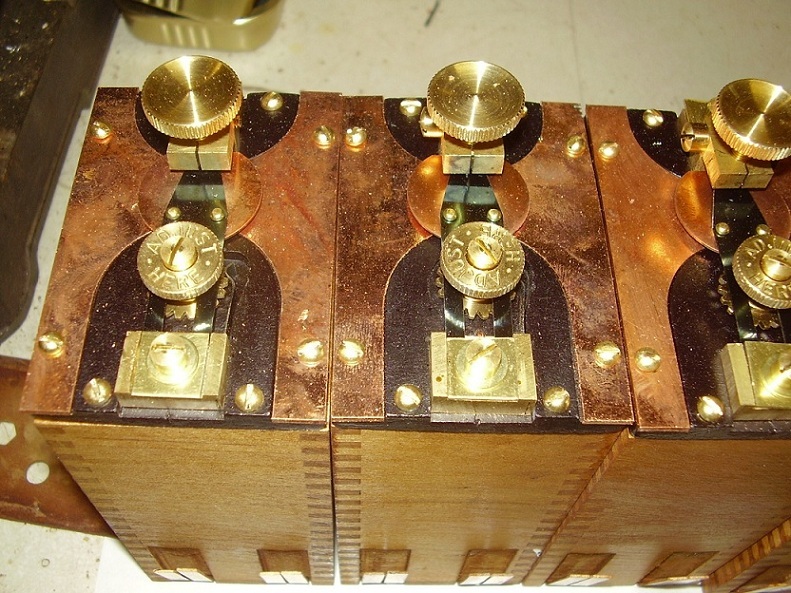 The "magnet shields" (as Heinze called them) on either side of the tops are copper plated steel. The spring contacts on the bottoms are hard phosphor bronze. I had fun making the old-style Fillister head screws; the thread is #8-40 except for the lock screws on the bridge, which are a #8-32, and the ratchet nut post, which is #8-48. I have to say, they work as good as they look; they really bark. Bite too. Don't ask how I know. It seem to me that this is not OT, thanks for showing this. It is very fine work and I wish I could do the same. Each time as I see work I am amazed but I always have a question. 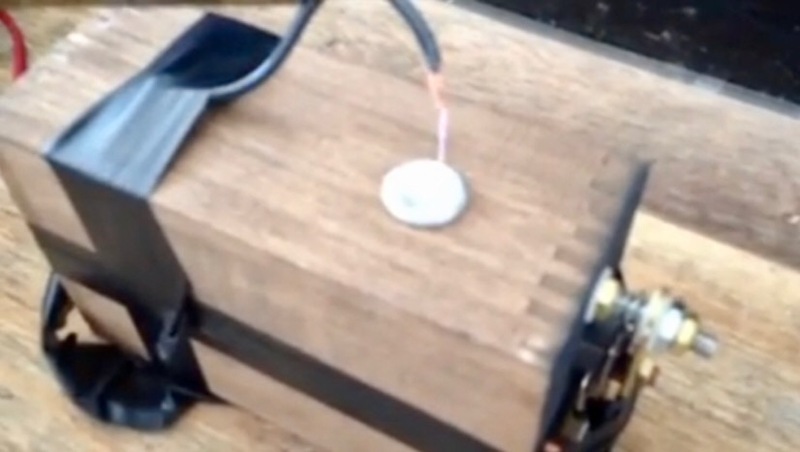 How does the magneto part of the ignition works?? What are the condensers for?? Again, Thanks for showing this. Ignition, The spark is generated when the points discharge the capacitor through the primary of the coil. Not when the points break like a Inductive discharge system. R.V., beautiful coils and work. I've been researching since seeing your original box. 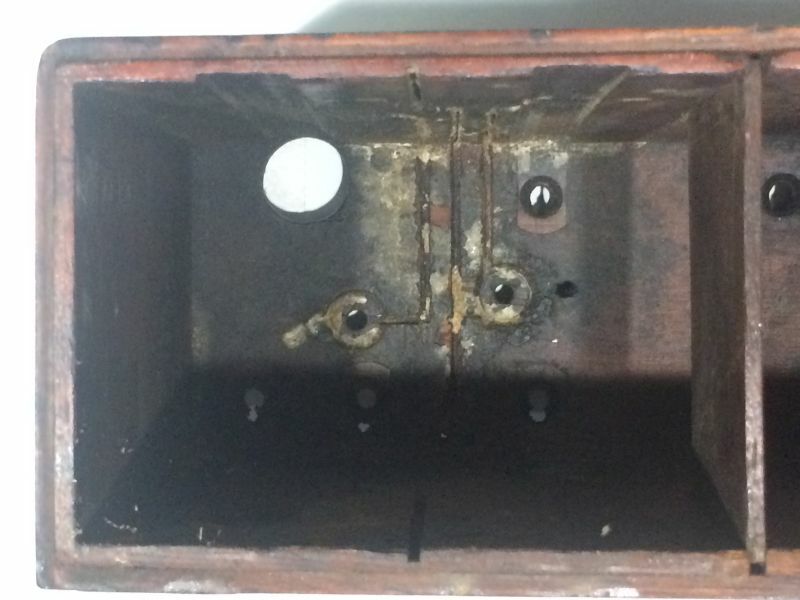 Both Model K I've owned had the hole (Dean posted one) for the contact and insulator to drop through and attempt to avoid arcing. 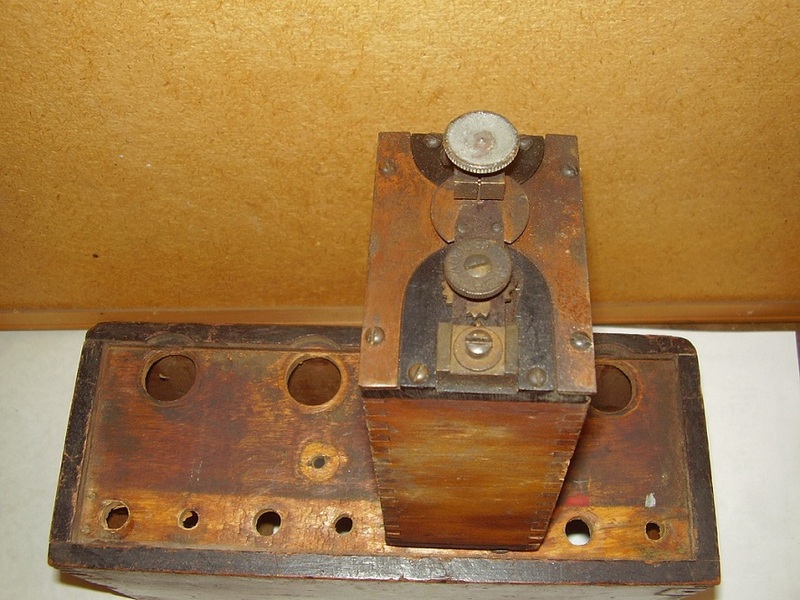 The first CDI in the world (Capacitive Discharge Ignition) for a production automobile occurred with the Model K Ford. Ed "Spider" Huff designed the switching (Tesla patented the theory in 1898, but was unable to develop the switching), with Henry Ford as the Assignee for the patent. It's a remarkable, high voltage system that will "rock your world" if you happen to catch a stray bit of voltage. I looked at the three Model K parts book I have, and it appears the system evolved to interchangeable coils. 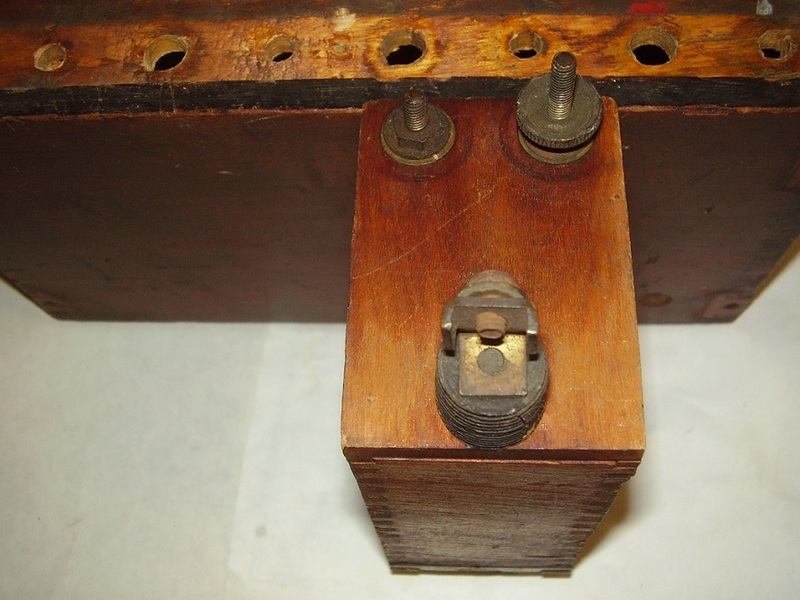 However, both K's I owned (both 1907) had a separate coil that had the extended contact with additional insulation. 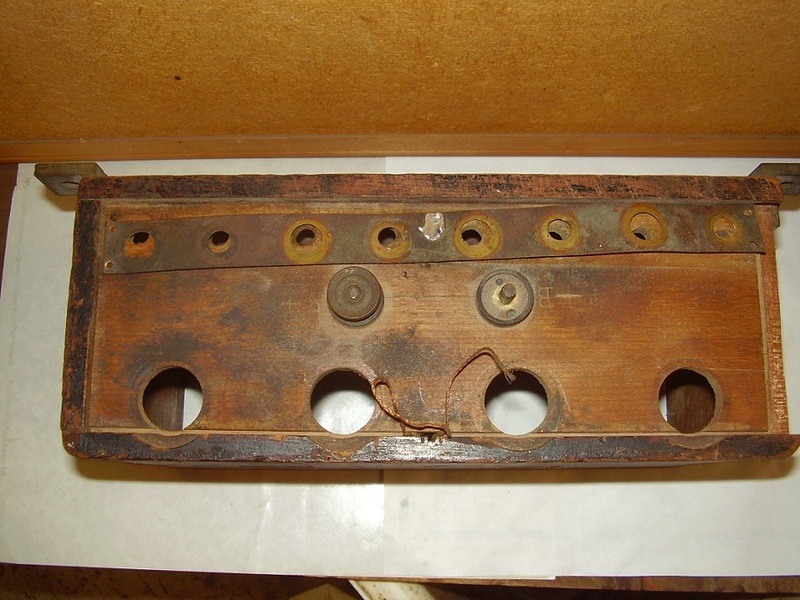 The Model K Ford offered three independent ignition systems (four, if you had two batteries). On the left, battery side, your options were battery one and battery two. Six coils and a commutator gave the same ignition system as NRS provided. The switch went right or left of center for either. On the right switch, it listed BAT and MAG. On the BAT side, the car runs through the distributor portion of the magneto, using the battery and coil and internal condenser (somewhat like a Model T with master coil). When switched to MAG, you had a full blown CDI. The magneto (source of electric charge) charged the condenser, and then sent the electric charge through the magneto coil and on to the spark plug. When you see this magneto in operation, it makes a person take notice. The spark will arc as far as you ask, especially with decent rpm, until a coil will finally fail and arc internally. If you click on the link below, you'll see Dean Yoder demonstrating the spark of this amazing creature. CDI didn't appear on automobiles as standard equipment again until the late 1950's. that was used in the 1909 Blitzen Benz in this video? I think that is a standard coil ignition he is starting on, with a "fire" button that sends spark to all cylinders when he presses it. I think I see a Bosch mag followed with a distributor/coil system for their dual ignition system. The Huff Ford Magneto (CDI) was first seen on the Ford six cylinder racer in January 1905. 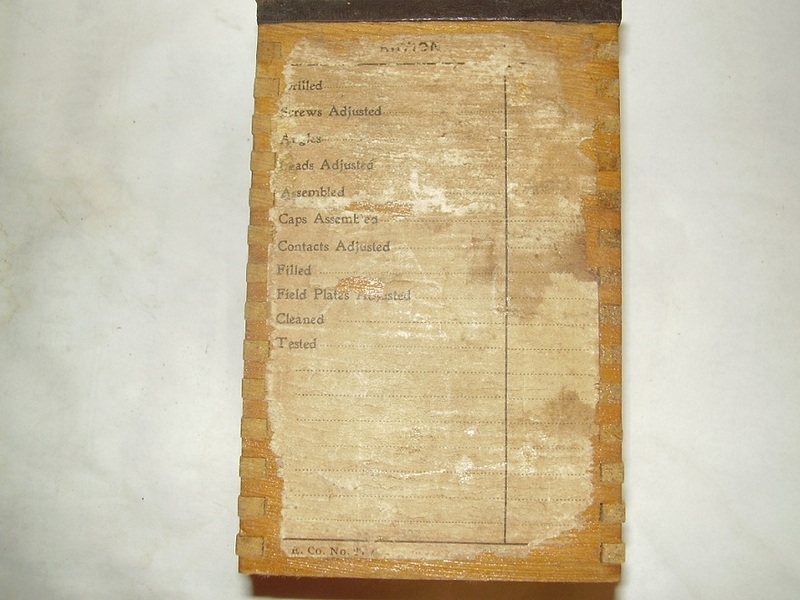 Patent was applied for in July 1905 and issued to Henry Ford in the spring of 1908. 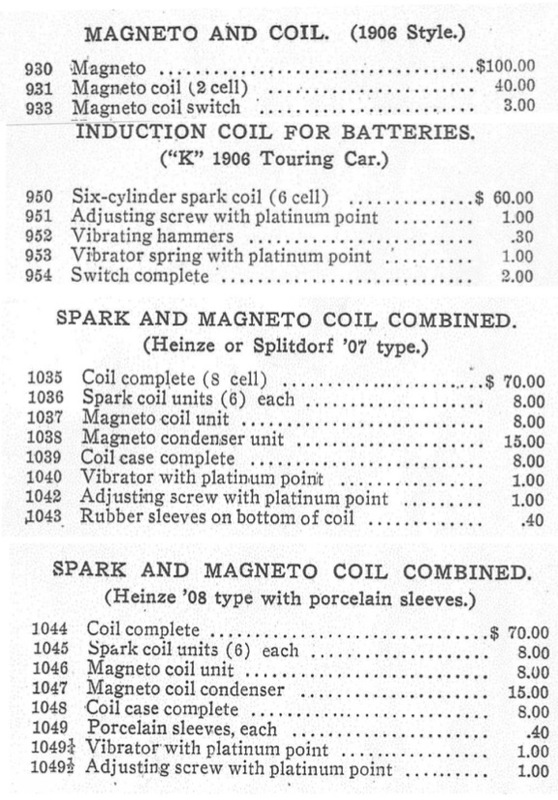 The Magneto was improved on with advances made for each Model K year. The 1906 version didn't allow use as a battery/coil/distributor system as the 07 and 08 versions did. Thanks Rob, for all that additional information and history! 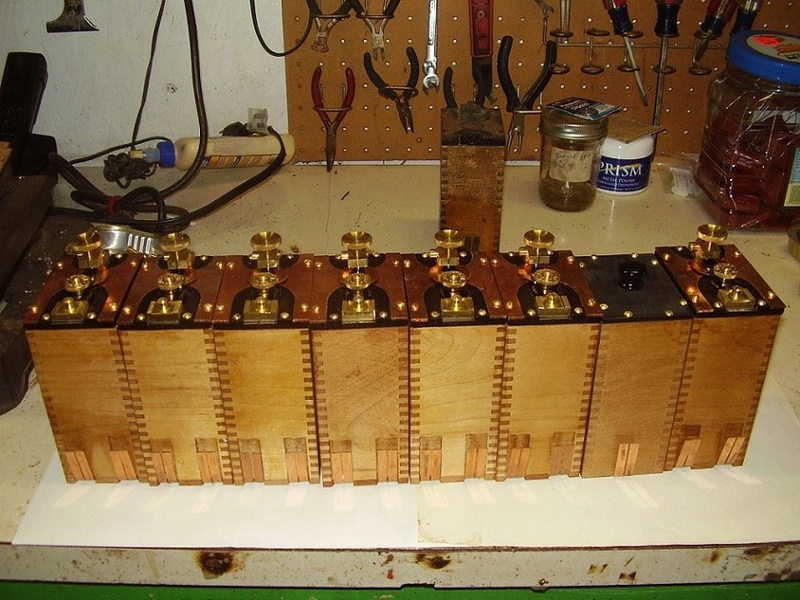 I'm working on an article for the magazine that traces the "evolution" of all the wood box coils used on the T. Heinze units "evolved" more than any other; they have many changes from the K to the T, and during the T era. The "porcelain sleeves" units were also used on the Model(s) S in '08, but they are completely different from the type listed above for the K. Even so, the evolution from the '06/'07 types is clear.